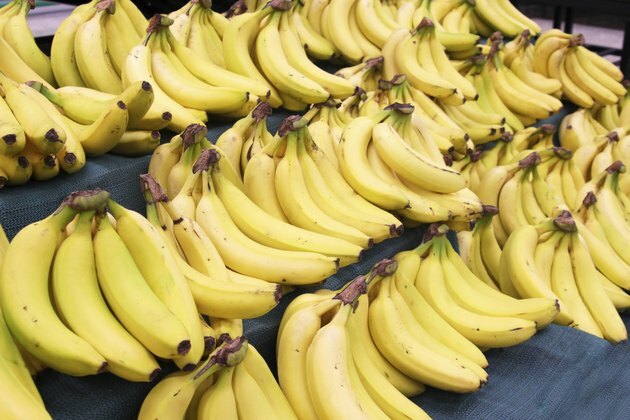 Bananas, the fourth largest fruit crop in the world, provide a number of essential nutrients, including fiber, potassium, manganese and vitamins B-6 and C. However, in some cases they can cause gas or constipation, especially when eaten before they are ripe or consumed in large amounts. While bananas don't always cause gas, they can do so, according to Drugs.com. Bananas contain both soluble fiber and fructose, both of which can cause gas. The breakdown of the fiber in the large intestine creates gas, especially if you consume more than your body is used to, and some people have difficulty digesting fructose, especially when consumed in large amounts. Bananas can cause constipation, notes the website BreastCancer.org. In a study published in the "European Journal of Gastroenterology and Hepatology" in June 2005, 29 to 48 percent of people considered bananas constipating foods. Although bananas can cause constipation, they can also be helpful in alleviating this condition because of their high fiber content. A small banana provides 10 percent of the daily value for fiber. Are Bananas a Source of Fiber?